I just wanted to go on record and say I fully support NBA Commissioner David Stern’s stance on this subject. What LeBron did demonstrated bad sportsmanship and made both the Cavs and the NBA as a whole look bad. When the face of a franchise and/or a league commits such a petulant act, there are bound to be consequences. The most obvious being (you guessed it) how his actions affect children. I know it’s corny, but it’s also true. What kind of message is sent when the most popular player in the league leaves the court without shaking hands after a tough, but deserved loss? Little Johnny will start to think that he doesn’t need to shake anybody’s hand because LeBron didn’t. What really surprised me was that even his Team USA teammate, Dwight Howard, was not exempt from his poor sportsmanship. This is the same Dwight Howard that LeBron won a gold medal with halfway across the world only last summer. Everyone knows that you have to shake hands after a game of basketball. It’s part of the code. It doesn’t matter what level you’re playing at and who you’re playing against. You didn’t see Larry Bird walk off without shaking hands after a finals loss to Magic Johnson or vice versa. I never saw Michael Jordan skip an interview because he was so angry he chose not to go. These ‘greats’ never stooped to that level. LeBron has a little bit of growing up to do in this department. I also think Stern should also be recognized for changing his initial position on the subject. It was originally released that the league was not going to fine LeBron. However, after reviewing the case, Stern had a change of heart and altered his position. It’s refreshing to see someone of such power in any sport to admit they were wrong and then do something about it. Or maybe Stern realized that there wasn’t going to be a dream matchup of Kobe against LeBron and that the stupid puppet ads which promoted this ideal matchup would now be useless . 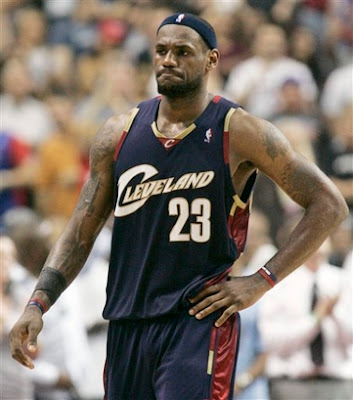 He could have thought that 25k would teach LeBron to play harder next time there were ads predicting him in the Finals. This is possible, but I’d like to give Stern the benefit of the doubt. Anyways, we await LeBron’s apology. I’m sure we’ll get one after he gets enough rest from that surgery to remove some sort of growth in his mouth. Gross. The fact that it’s a benign growth just makes it sound that much nastier. This entry was posted on Saturday, June 6th, 2009 at 8:03 am and is filed under NBA. You can follow any responses to this entry through the RSS 2.0 feed. You can leave a response, or trackback from your own site. Maybe the tumor was inside his head, causing him to act like a jackass. Well, you visit some blogs and there are those who actually condone and applaud his immaturity. Interestingly enough, some blogger said that James’ act is a reflection of the values of modern America-which reminded me of the time the track and field team of the U.S.A. celebrated after they won the gold medal in the Olympics (I think it was 2004). That act also left a bad taste in everyone’s mouth. haha, i think that blogger may be a little pessimistic. even so, if that is true than it’s a good thing he was fined because it shows that’s not how one is supposed to act. it obviously wouldn’t make a dent in his wallet, but it shows to other players and to viewers (especially younger ones) that it was the wrong thing to do. I think it’s good he got fined simply because the NBA requires players to attend postgame press conferences and has fined players in the past. Stern didn’t seem like he wanted to fine LeBron at all, but caved to the pressure. You gotta love the media!